Companies report continued growth in the biomedical market. As diagnostic and treatment technologies evolve and increasingly turn to light, medical device manufacturers increasingly turn to fiber optic components and systems to deliver that light to tissues and organs. They might as well – the market is not only strong but also expanding, according to industry leaders. “The market has been very robust,” said Rob Morris, marketing operations manager at Ocean Optics in Dunedin, Fla., which provides mini fiber optic spectrometers as well as fiber optical chemical sensors for use in R&D, point-of-care analysis and medical diagnostics. “Although we don’t sell medical devices, we sell optoelectronic sensing components to customers who integrate those components into their own devices. Versatility is one of those inherent properties that give fiber optics a huge advantage. That’s useful for medical device development. As new and better imaging methods are born, for example, photonics-based techniques are moving in on the market. Traditional x-ray imaging is being replaced by CMOS-based detectors using fiber optic faceplates, said Scott Farland, director of business development at Incom Inc. in Charlton, Mass. Farland added that the faceplates help the CMOS detectors produce better images, lower radiation exposure on the sensors and bring down operating costs. “Sales of these systems [have] been increasingly strong in the past 18 months, with a very strong forecast over the next several years as market adaptation continues to grow.” He predicted that all current digital radiography applications will quickly move to the CMOS-based platform. Fiber optics can take various forms for a range of biomedical applications. Top to bottom: a ball lens, an OCT probe and a fiber probe. Courtesy of Vytran. Today’s thriving applications include OCT and other applications employing lasers, due in part to the desire for less-invasive delivery methods and also sources that are less destructive to samples. “Laser-based applications such as Raman certainly have shown a surge of interest,” Morris said. “Raman is a very useful technique for chemical analysis, especially because of the strong specificity of the Raman signature of many samples. And these are fast-moving fields, especially in imaging and diagnostics. “The advances come so quickly, it can be hard to keep up,” Morris said. “We’ve had customers involved in all sorts of interesting diagnostics research, from point-of-care blood monitoring to noninvasive cancer detection. 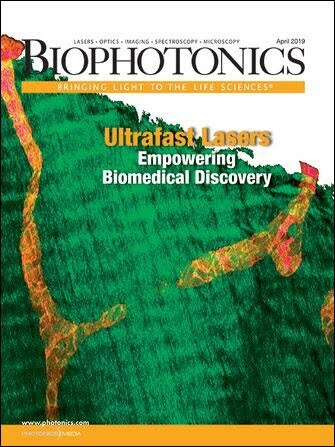 But biophotonics companies are not content to sit back and see what happens: They’re also out on the front lines, working with researchers and clinicians to develop new tools and techniques. “Incom is currently collaborating with several universities and national labs to develop next-generation PET detectors by combining microchannel plate and traditional photomultiplier tube technology,” Farland noted. Imaging quality and accuracy are always improving, Pelaprat said. “The new devices will soon percolate into manufacturing,” he added. These companies are working to develop “the next big thing,” but the definition of that term varies from one company to the next. This image was taken as part of a study of contusions in suspected victims of child abuse. Spectroscopy can be used to test the age of the bruise and is a more reliable indicator than visual inspection. Courtesy of Ocean Optics. Incom is developing a capillary-based x-ray antiscatter grid that Farland said could be a highly disruptive technology in digital radiography. He also said that full-chest-area CMOS-based x-ray detectors drove the development of the largest-ever fiber optic faceplates: up to 17 x 17 in. But there are challenges, even in a growing field. The speed of technological development means that, for companies, continuing to innovate and improve upon technologies can bump heads with the need to simultaneously meet increased volume demands, Farland said. And there’s always the government: Getting approval for new medical devices tends to be very costly, Bakhshpour pointed out. All of which will mean more business. “We believe that the manufacturing cost of these medical devices is dramatically reduced as a result of high-volume manufacturing techniques and, thus, manufacturing volumes will go from tens of thousands to millions,” Pelaprat said. The development of fiber optic sensors that monitor the condition of intensive care patients is among the projects that will benefit from a £32 million (about $49 million) investment by the Engineering and Physical Sciences Research Council (EPSRC). The project is one of three involving smartphones, probes and sensors that aim to transform health care, the council said. The EPSRC is investing the money in establishing three new health care interdisciplinary research collaborations (IRCs); an additional £9 million (about $14 million) is being contributed by universities and project partners. “Today’s health care challenges are many and complex; designing and integrating technologies that will help clinicians to diagnose and monitor patients is where the cross-disciplinary research we are funding at these IRCs can play a vital role,” said EPSRC CEO Dave Delpy. The Multiplexed ‘Touch and Tell’ Optical Molecular Sensing and Imaging project will create a fiber optic device to detect disease and monitor critically ill patients without the need for blood sampling. Courtesy of the University of Edinburgh. The Multiplexed “Touch and Tell” Optical Molecular Sensing and Imaging project will create a fiber optic device to detect potentially fatal lung conditions in intensive care patients, and to continuously monitor the blood in critically ill adults and babies without the need for blood sampling. It will be led by professor Mark Bradley of the University of Edinburgh, working with Heriot-Watt University and the University of Bath as well as project partners ST Microelectronics, Carestream Health, Edinburgh Biosciences and the UK Astronomy Technology Centre. Under a £9 million EPSRC grant, the £11 million (about $17 million) project brings an interdisciplinary team together to design, make and test a small fiber optic probe that can be used at the patient’s bedside, inserted into his or her lung, blood vessels or other body parts, such as digestive, urinary or reproductive tracts. The probe will contain a variety of special optical fibers, some of which allow clinicians to “view” inside the lung, while others will be modified with sensors that can measure important parameters, such as oxygen concentration and acidity, in both blood and lungs in real time. The fiber will also deliver “smart reagents” that detect specific bacteria and viruses and sense other processes that can cause lung damage. Initially, the research will focus on patients in intensive care, where potentially fatal lung complications are a common problem with ventilated patients, and on critically ill babies, who often need to have blood samples taken to test oxygen and acid levels. The two other projects are a smartphone test and tracking systems for infectious diseases, and in-home sensors that can immediately relay patient information to doctors. For more information, visit www.epsrc.ac.uk.